This post is sponsored by the National Watermelon Promotion Board. 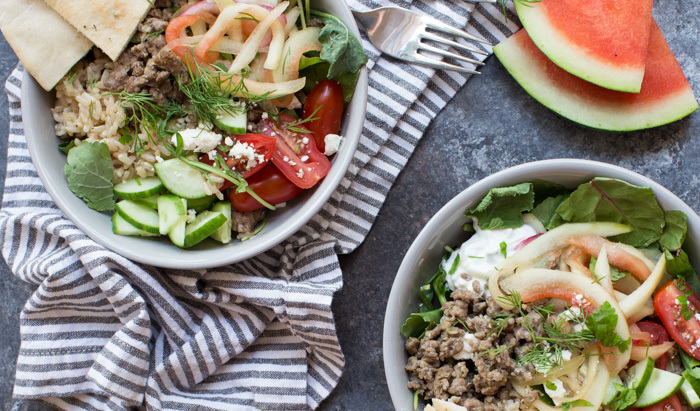 Gyro Salad Bowls with Pickled Watermelon Rind are what you make when you’re living life to the fullest. 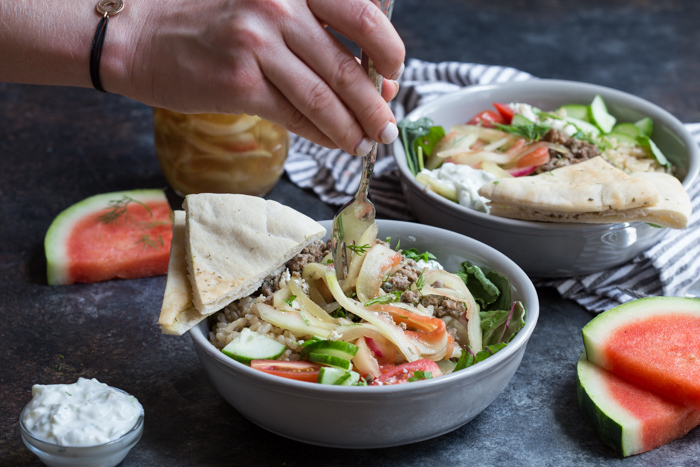 There’s a favorite Greek-inspired fast casual spot here in Orlando that we go to often and it most definitely inspired these gyro salad bowls. I ALWAYS order my gyro bowl with extra pickled onions. Can’t get enough of that sweet and tangy pickled flavor on top of savory and warm gyro meat. 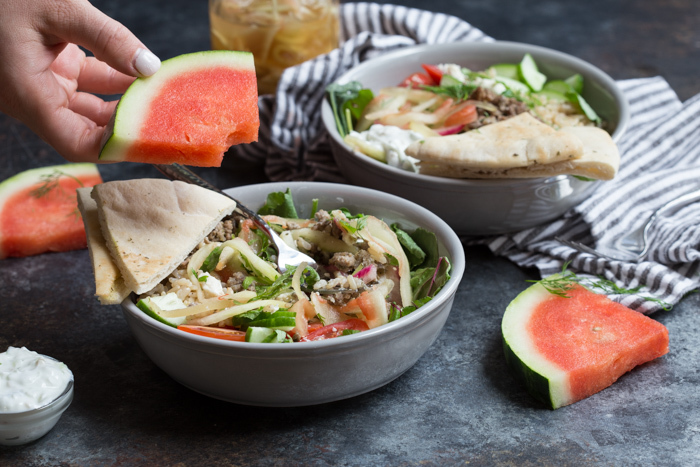 This year, I’ve teamed up with the National Watermelon Promotion Board and they’ve challenged me to create recipes that “use the whole watermelon” thus Gyro Salad Bowls with Pickled Watermelon Rind was born. 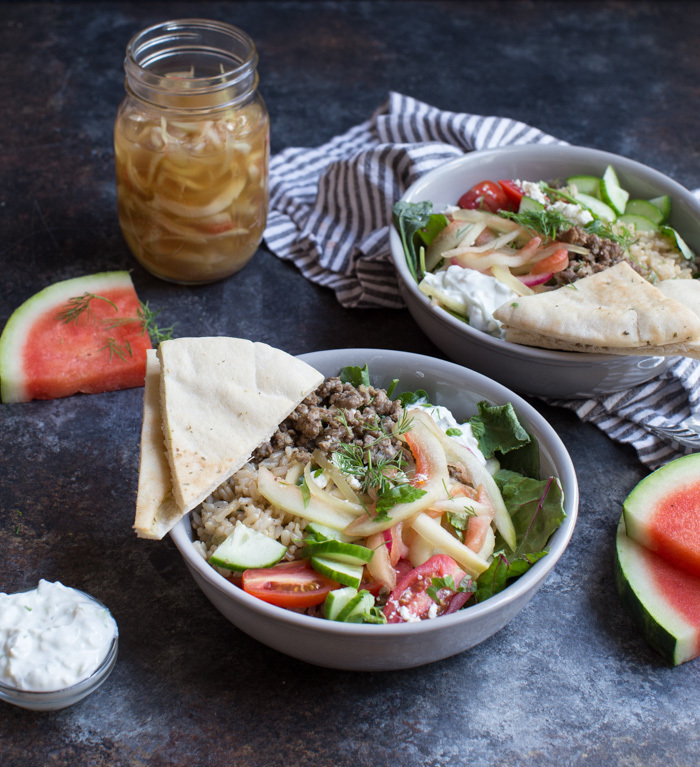 The cool crispness of pickled watermelon rind is the perfect topping for these gyro salad bowls. I’m like so in love, ya’ll. 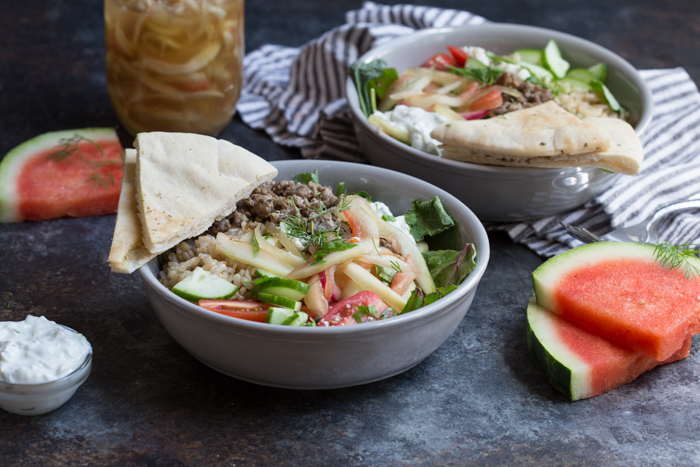 Instead of tossing your watermelon rind, pickle it and make gyro salad bowls! You’ll get a nutrition boost too. The amino acid L-citrulline is concentrated in watermelon rind and may help to reduce muscle soreness post workout. L-citrulline is used in the body to produce nitric oxide, a blood vessel relaxor that helps with improving blood flow. And I’m so pumped about this recipe because making gyros at home can be a challenge but I’ve streamlined the process to give you MEGA flavor with little effort. These gyros are made with ground lamb and packed full of flavor that you’d get at your favorite Mediterranean restaurant but the recipe is simple enough to make on a weeknight with minimal effort. or save time and use frozen pre-cooked rice! 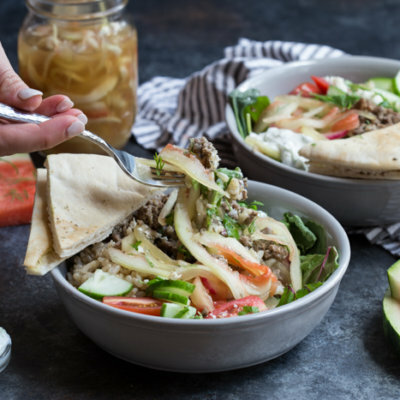 Say goodbye to your standard chicken and broccoli meal prep because these Gyro Salad Bowls with Pickled Watermelon Rind will knock your socks off and make an awesome meal to prep in advance for the busy week. Oh and if you are looking for more ideas on how to #UseTheWholeWatermelon join us for a twitter party on Thursday, July 6th at 4pm EST. The Watermelon Board will be sharing recipes and tips and giving away some cool prizes! And if you like to create recipes, don’t miss their recipe contest. 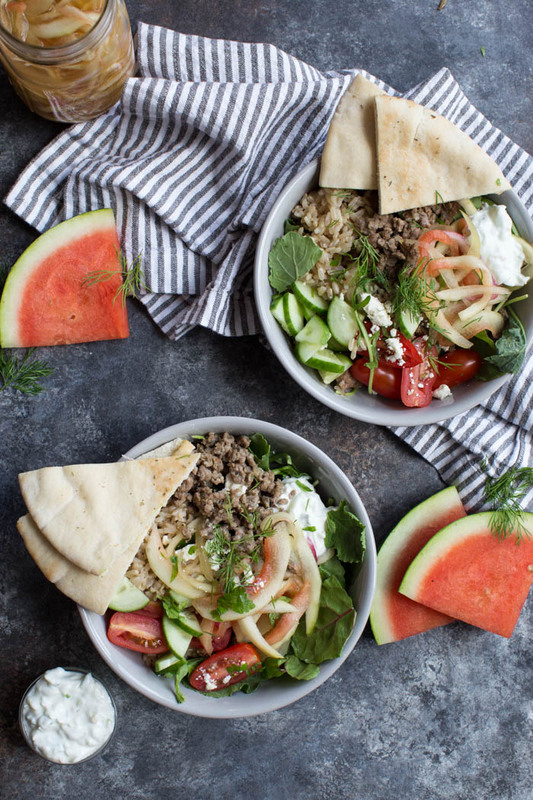 Gyro Salad Bowls with Pickled Watermelon Rind are what you make when you’re living life to the fullest. 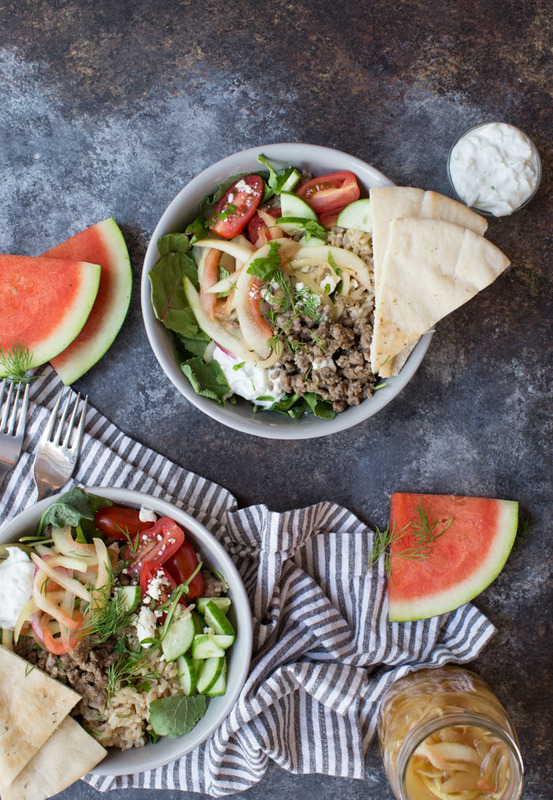 Instead of tossing your watermelon rind, pickle it and make gyro salad bowls! Add watermelon rind, water, vinegar, maple syrup and salt to 32 ounce canning jar. Cap it and place in fridge, allowing to soak for at least 24 hours. Keep refrigerated. Prepare rice according to package instructions cooking in chicken broth and juice of 1 lemon instead of water. Once rice is cooked, stir in 2 tablespoons minced parsley. Alternatively, for a faster cooking method, use pre-cooked brown rice and season with fresh parsley and a squeeze of lemon. Over medium heat, add 1 teaspoon olive oil to non stick pan and saute onion and garlic for a few minutes until translucent. Stir in lamb and thyme, oregano, cumin, salt and pepper. Cook until lamb is browned and fully cooked. Remove from heat. Prepare tzatziki sauce in a small bowl, by mixing together yogurt, cucumber, garlic and mint. Set aside. 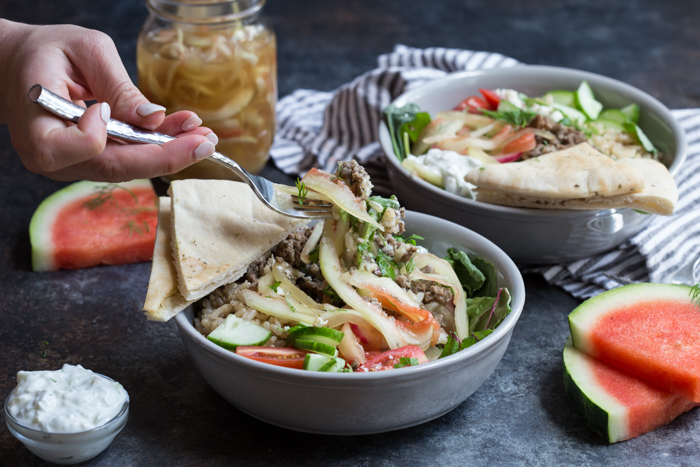 Assemble salad bowls with a bed of greens, brown rice, gyro meat, tomatoes, cucumber, feta cheese, pickled watermelon rind and topped with tzatziki sauce. Serve with side of pita. Love gyros! And the love the idea of making a bowl even better! I have an obsession with Greek food! And these look so yummy and refreshing I cannot wait to try! SO creative! I had no idea you could pickle watermelon. 🙂 Perfect way to keep from wasting! These bowls look perfect for meal prep. Super cool idea! Would have never have though to pickle watermelon rind. Cool! I’ve never tried pickled watermelon before, but these bowls sounds amazing! These bowls look so good! I can’t say I’ve ever tried pickled watermelon rind but perfect timing as we are taking 2 up to my parents for the 4th so perfect time to test it out! Now this is the freshest looking gyro I’ve ever seen! 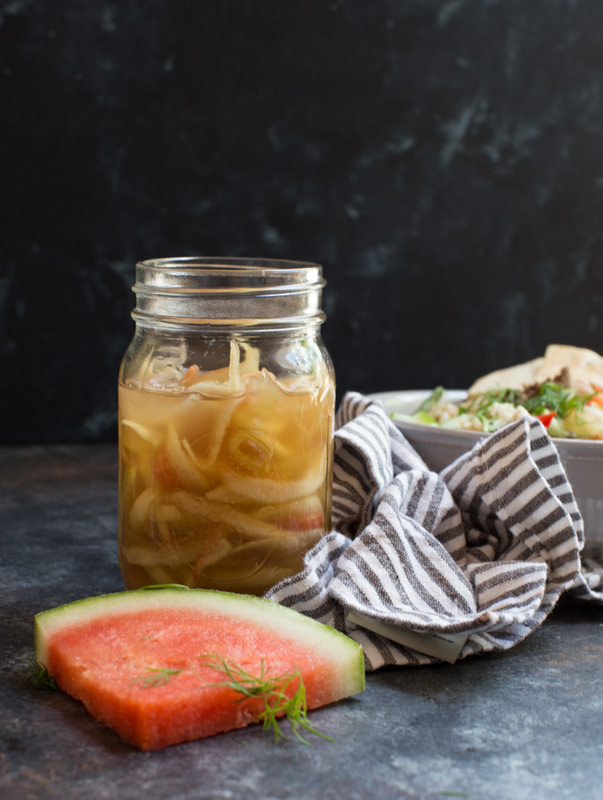 I love how you pickled the watermelon rind – I’ve heard about doing this but never attempted! These sound so flavorful! Such a creative way to use up the watermelon rinds! Gyro is one of my other half’s faves. I can’t wait to make this at home! I just love it when the old culinary arts are revived—like making pickled watermelon rinds. The first time I had them I couldn’t believe something I would have tossed out could have been transformed into such a tasty condiment. I’ll have to give your recipe a try! I’m loving everything about these bowls! What a great idea pickling the watermelon rind! Looks like you met the challenge of using the whole watermelon in a most delicious way! I can’t wait to try these bowls! Oh my goodness! I love pickle and I love watermelon! I KNOW I will love the two together! I also love gyro meat! I need to make this very soon!